The Church of the Holy Sepulchre in the Old City of Jerusalem — venerated as the place where Jesus Christ died and rose again — contains a bewildering conglomeration of 30-plus chapels and worship spaces. There are no helpful signs. This article describes the most significant areas that are not covered in the main Church of the Holy Sepulchre article. The description begins at the main door (on the south side of the church) and circles the church in a roughly clockwise manner. On the wall behind the stone, a Greek mosaic depicts (from right to left) Christ being taken down from the cross, his body being prepared for burial, and his body being taken to the tomb. To the left of the Stone of Anointing is a small circular slab with four pillars surmounted by a marble canopy. 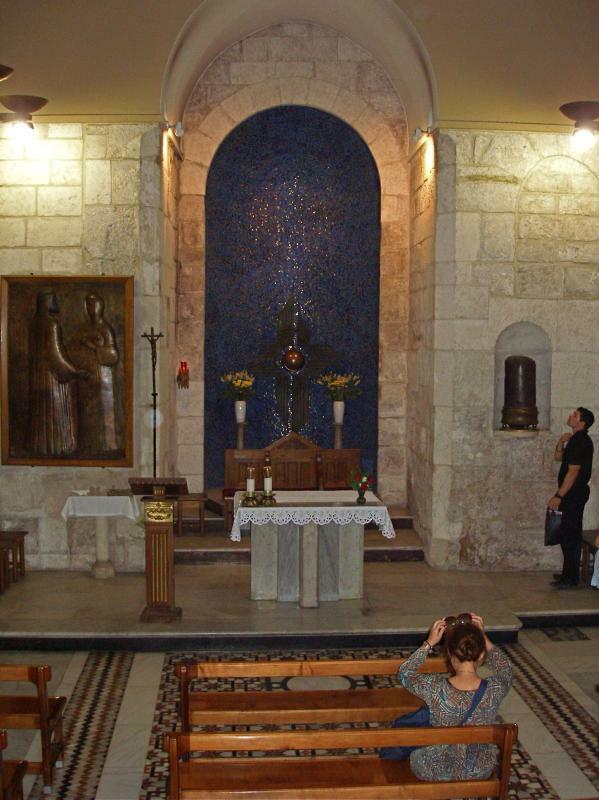 This shrine is the Armenian Station of the Holy Women. It commemorates Jesus’ mother and her companions who viewed the crucifixion. On the wall behind the shrine, a large mosaic recalls the scene. The Armenians’ sacristy is on the left. The lofty circular stone structure encompassing this whole area is known as the Rotunda. Above it is a huge dome decorated with a starburst of light. Opposite the entrance to the Tomb, a triumphal arch built by the Crusaders leads to the basilica’s central worship space, the Katholikon. Originally the choir of the 12th-century Crusader church, it is now the Greek Orthodox cathedral. A highly decorated screen called the iconostasis partially hides the altar from view. On the polished marble floor stands a goblet marking the “omphalos” (navel), the legendary centre of the earth. 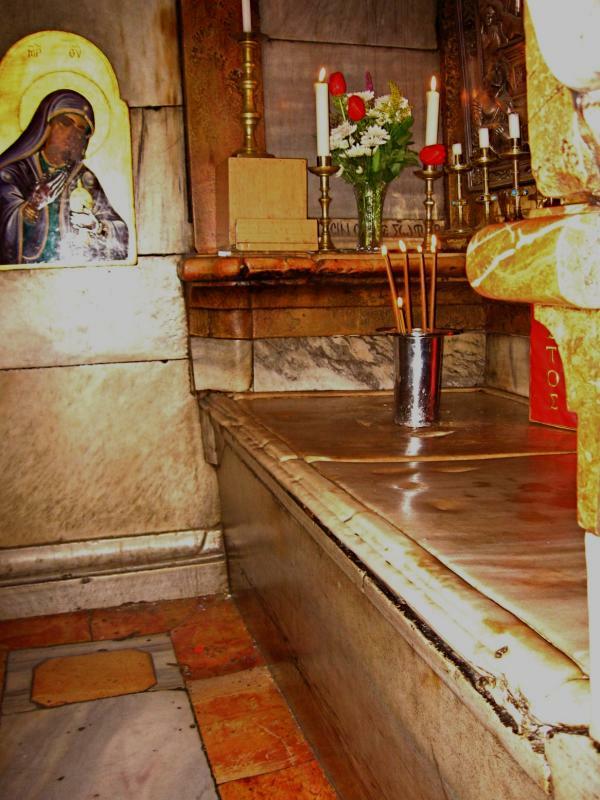 There are thrones for the patriarch of Jerusalem and the patriarch of Antioch. Behind the Tomb is a tiny Coptic chapel attached to the edicule. Directly opposite this tiny chapel, walk between two of the pillars of the Rotunda into a dilapidated room, the Syriac Orthodox Chapel of St Joseph of Arimathea and St Nicodemus. On Sundays and feast days it is furnished for the celebration of Mass. On the far side of the chapel is the low entrance to two complete 1st-century Jewish tombs. 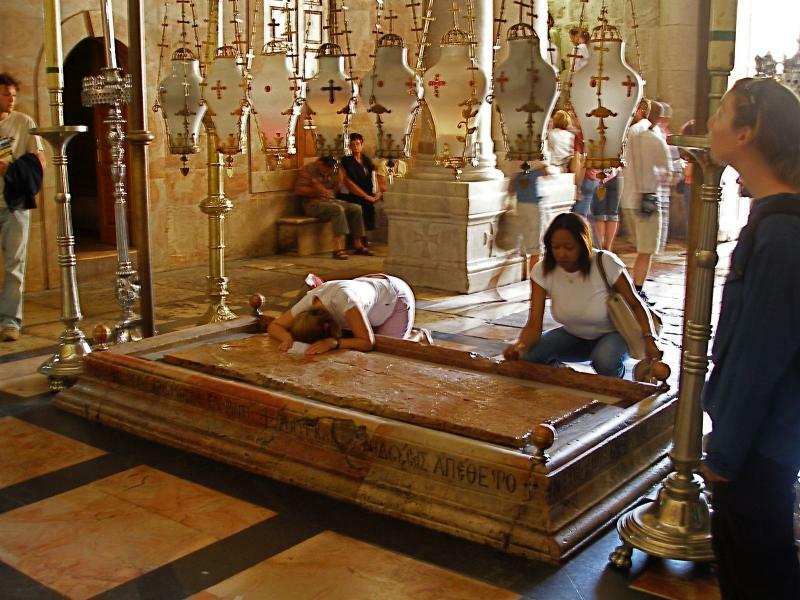 Since Jews always buried their dead outside the city, this proves that the Holy Sepulchre site was outside the city walls at the time of the crucifixion. There is a tradition that Joseph of Arimathea and Nicodemus were buried here. Returning to the Rotunda, the area to the left (on the north side of the church) belongs to the Catholics. There is an altar dedicated to St Mary Magdalene, then double bronze doors (donated by the people of Australia in 1982) lead to the Franciscan Chapel of the Apparition. It commemorates the ancient tradition that Jesus appeared to his mother after his Resurrection, an event not found in the Gospels. On the right inside the entrance of the chapel is a section of a column, said to be the one to which Jesus was tied when he was scourged. Along the far wall, scenes of the Way of the Cross are depicted in wrought iron. Returning past the altar of St Mary Magdalene, turn left into a rather dark gallery, known as the Arches of the Virgin (commemorating a belief that Mary made visits to her son’s Tomb). It contains pillars and other remains from earlier constructions. At the far end, on the left, is a small Greek chapel called the Prison of Christ, apparently based on a belief that he was temporarily confined here before the crucifixion. Further around the semi-circular aisle are two chapels on the left. The first is the Greek Chapel of St Longinus. It is dedicated to the Roman soldier who pierced Jesus’ side with his spear and then accepted him as the Son of God. Further along is the Armenian Chapel of the Division of the Raiment, recalling that the Roman soldiers divided Christ’s clothes among them. Next on the left is a stairwell, its walls inscribed with hundreds of crosses by pilgrims in past centuries. The 29 steep steps descend to the underground Armenian Chapel of St Helena. This was the crypt of the emperor Constantine’s 4th-century basilica and is therefore the oldest complete part of the entire building. The Armenians have re-named the chapel to honour their national patron, St Gregory the Illuminator. The left-hand altar is dedicated to St Dismas (the Good Thief). In an ancient quarry behind a wrought iron gate (open only with permission from the Armenians) is the Chapel of St Vartan and the Armenian Martyrs. From the right of the chapel, another steep staircase of 22 steps leads to the Franciscan Chapel of the Finding of the Cross. This rough-walled area has been built within part of the ancient quarry, apparently later converted into a cistern for water storage. Here, according to tradition, St Helena (Constantine’s mother) discovered the True Cross and other instruments of the Passion and crucifixion. 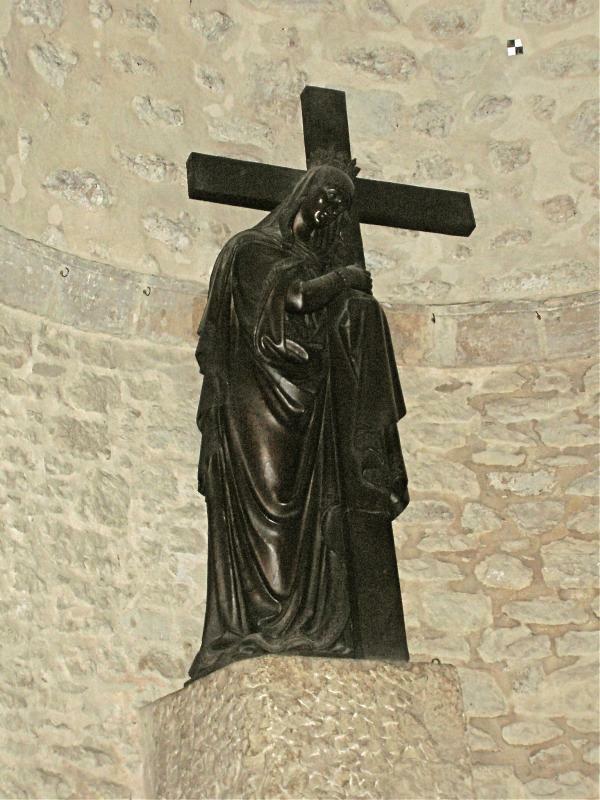 A statue behind the altar shows her holding the Cross. Remnants of 12th-century frescoes are displayed behind glass walls. After ascending all the steps to the ground floor again, immediately on the left is the Greek Chapel of the Derision. It commemorates the mocking of Jesus by the Roman soldiers. Under the altar is a fragment of a column, said to be the one Jesus sat on when the crown of thorns was put on his head. Further along, on the left, a glass screen protrudes slightly into the aisle. Through it can be seen the natural rock of Calvary. Next to it is a small area called the Chapel of Adam. 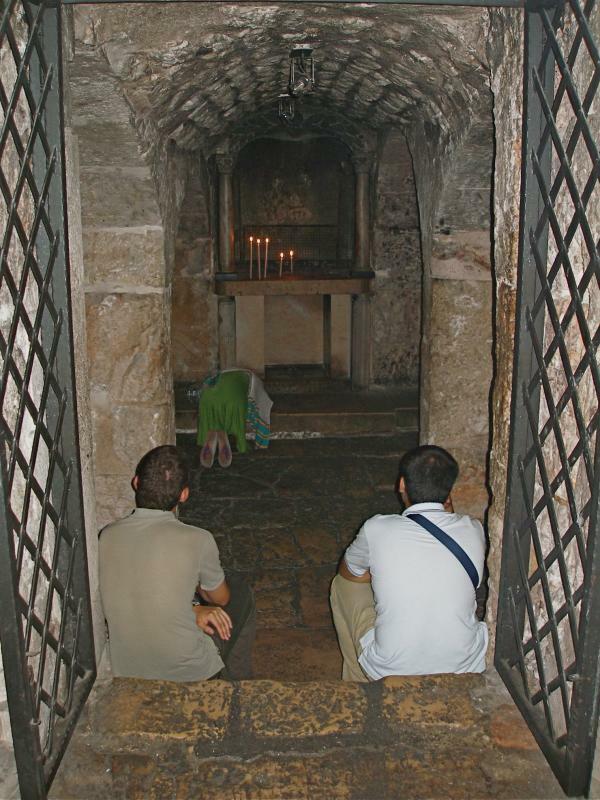 It is directly beneath the Chapel of Calvary upstairs, and an ancient tradition suggests that Adam was buried here and that the blood of Jesus tricked down to his skull. Here the rock of Calvary can be seen again, with a fissure running through it. Some believe the fissure was caused by the earthquake at the time Christ died. Others suggest that the rock of Calvary was left standing by quarrymen because it was cracked. From this chapel, a door leads to the Greek Treasury, holding relics including one of the True Cross. The treasury is usually closed. Under a decree called the Status Quo imposed by the Ottoman Turks in 1757, ownership of the Church of the Holy Sepulchre is shared between the Greek Orthodox, Catholics (known in the Holy Land as Latins) and Armenian Orthodox. Three minor communities, Coptic, Syriac and Ethiopian Orthodox, have rights to use certain areas. All the churches jealously guard their rights. One effect of the Status Quo can be seen by looking above the main entrance on leaving the church. The wooden ladder leaning against a window ledge has been there since early in the 18th century. Nobody knows why it is there, but because it was in place when the Status Quo began in 1757, it must remain there. As one faces the main entrance, to the right is a disused stairway that was the Crusaders’ entrance to Calvary. At the top of the stairs is the Chapel of the Franks. Beneath it is the Greek Orthodox Chapel of St Mary of Egypt — a prostitute who was converted in the church courtyard in the 4th century and spent the rest of her life as a hermit. Opens: Apr-Sep 4am, Oct-Mar 5am. Closes: Apr-Aug 8pm, Mar and Sep 7.30pm, Oct-Feb 7pm. Sunday morning liturgies are usually: Coptic 4am, Catholic 5.30am, Greek Orthodox 7am, Syriac Orthodox 8am; Armenian Orthodox 8.45am on alternating Sundays with a weekly procession at 4.15pm. The Church of the Holy Sepulchre in the Old City of Jerusalem covers what Christians believe is the site of the most important event in human history: The place where Jesus Christ rose from the dead. But the pilgrim who looks for the hill of Calvary and a tomb cut out of rock in a garden nearby will be disappointed. • At first sight, the church may bring on a sense of anticlimax. Looking across a hemmed-in square, there is the shabby façade of a dun-coloured, Romanesque basilica with grey domes and a cut-off belfry. • Inside, there is a bewildering conglomeration of 30-plus chapels and worship spaces. These are encrusted with the devotional ornamentation of several Christian rites. 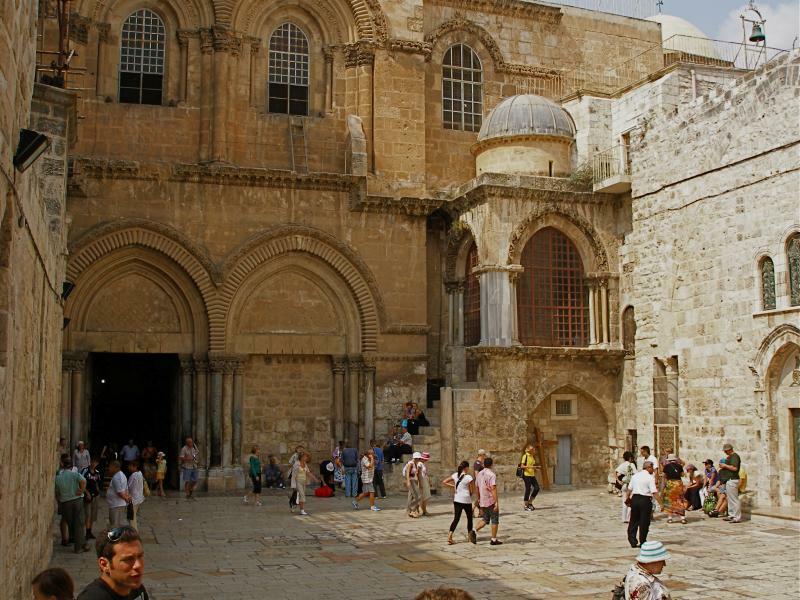 This sprawling Church of the Holy Sepulchre displays a mish-mash of architectural styles. It bears the scars of fires and earthquakes, deliberate destruction and reconstruction down the centuries. It is often gloomy and usually thronging with noisy visitors. Yet it remains a living place of worship. Its ancient stones are steeped in prayer, hymns and liturgies. It bustles daily with fervent rounds of incensing and processions. 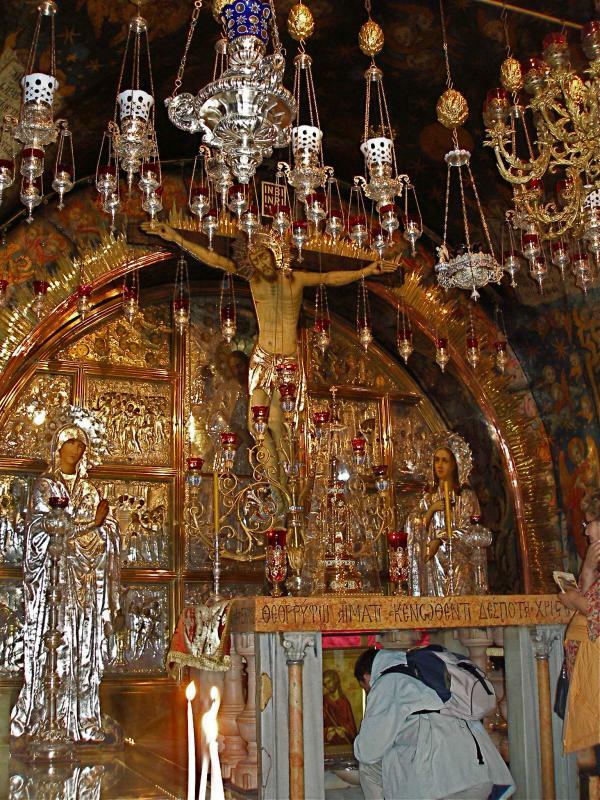 This is the pre-eminent shrine for Christians, who consider it the holiest place on earth. And it attracts pilgrims by the thousand, all drawn to pay homage to their Saviour, Jesus Christ. Early Christians venerated the site. Then the emperor Hadrian covered it with a pagan temple. Only in AD 326 was the first church begun by the emperor Constantine I. He tore down the pagan temple and had Christ’s tomb cut away from the original hillside. Tradition says his mother, St Helena, found the cross of Christ in a cistern not far from the hill of Calvary. Constantine’s church was burned by Persians in 614, restored, destroyed by Muslims in 1009 and partially rebuilt. Crusaders completed the reconstruction in 1149. The result is essentially the church that stands today. Of all the Christian holy places, the Church of the Holy Sepulchre is probably the most difficult for pilgrims to come to terms with. To help make sense of it, this article deals with the church’s major elements and its authenticity. 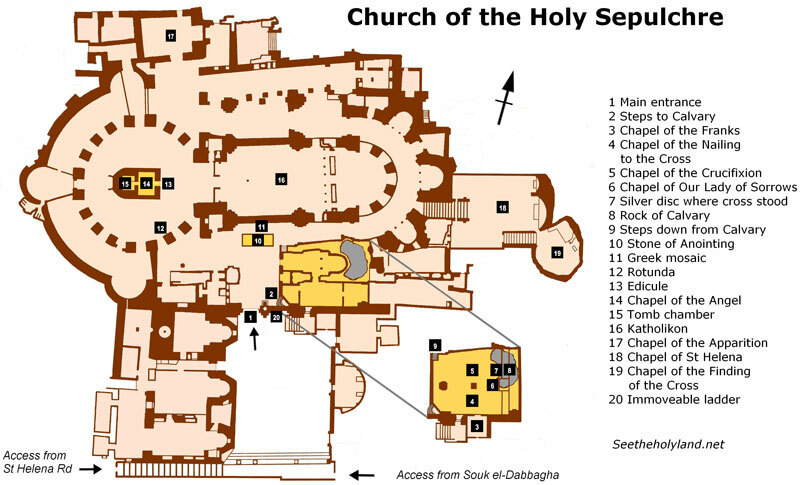 A further article, Church of the Holy Sepulchre chapels, deals with its other devotional areas. 1. The main access to the church, on its south side, is from the Souk el-Dabbagha, a street of shops selling religious souvenirs. Visitors enter the left-hand doorway (the right one was blocked up by Muslim conquerors in the 12th century). 2. Instead of following tourists into the often-gloomy interior, immediately turn hard right and ascend a steep and curving flight of stairs. You are now ascending the “hill” of Calvary (from the Latin) or Golgotha (from the Aramaic), both words meaning “place of the skull”. The stairs open on to a floor that is level with the top of the rocky outcrop on which Christ was crucified. It is about 4.5 metres above the ground floor. 3. Immediately on the right is a window looking into a small worship space called the Chapel of the Franks. Here the Tenth Station of the Cross (Jesus is stripped of his garments) is located. On the floor of Calvary are two chapels side by side, Greek Orthodox on the left, Catholic on the right. They illustrate the vast differences in liturgical decoration between Eastern and Western churches. 4. The Catholic Chapel of the Nailing to the Cross is the site of the Eleventh Station of the Cross (Jesus is nailed to the cross). On its ceiling is a 12th-century medallion of the Ascension of Jesus — the only surviving Crusader mosaic in the building. 6. Between the two chapels, a Catholic altar of Our Lady of Sorrows commemorates the Thirteenth Station (Jesus is taken down from the cross). 7. A silver disc beneath the Greek altar marks the place where it is believed the cross stood. The limestone rock of Calvary may be touched through a round hole in the disc. On the right, under glass, can be seen a fissure in the rock. Some believe this was caused by the earthquake at the time Christ died. Others suggest that the rock of Calvary was left standing by quarrymen because it was cracked. 8. Another flight of steep stairs at the left rear of the Greek chapel leads back to the ground floor. 9. To the left is the Stone of Anointing, a slab of reddish stone flanked by candlesticks and overhung by a row of eight lamps. Kneeling pilgrims kiss it with great reverence, although this is not the stone on which Christ’s body was anointed. This devotion is recorded only since the 12th century. The present stone dates from 1810. 10. On the wall behind the stone is a Greek mosaic depicting (from right to left) Christ being taken down from the cross, his body being prepared for burial, and his body being taken to the tomb. 11. Continuing away from Calvary, the Rotunda of the church opens up on the right, surrounded by massive pillars and surmounted by a huge dome. Its outer walls date back to the emperor Constantine’s original basilica built in the 4th century. 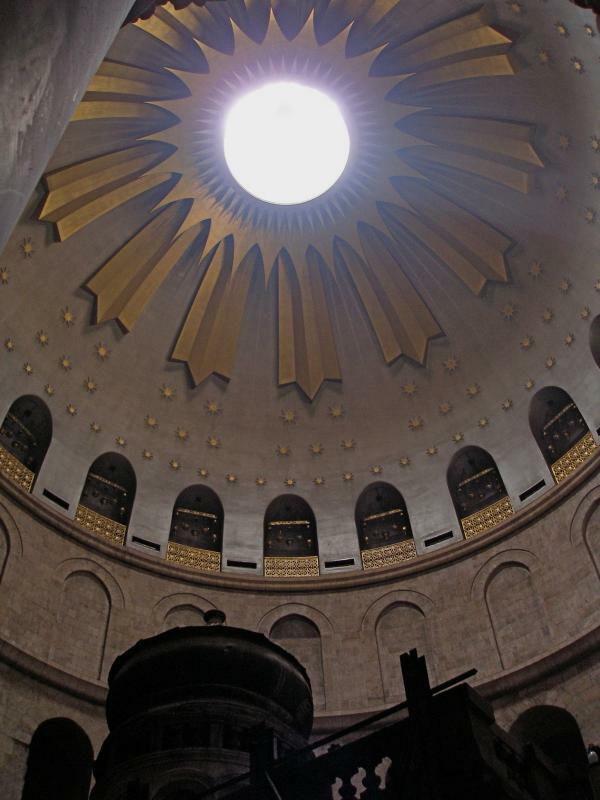 The dome is decorated with a starburst of tongues of light, with 12 rays representing the apostles. 12. In the centre is a stone edicule (“little house”), its entrance flanked by rows of huge candles. This is the Tomb of Christ, the Fourteenth Station of the Cross. 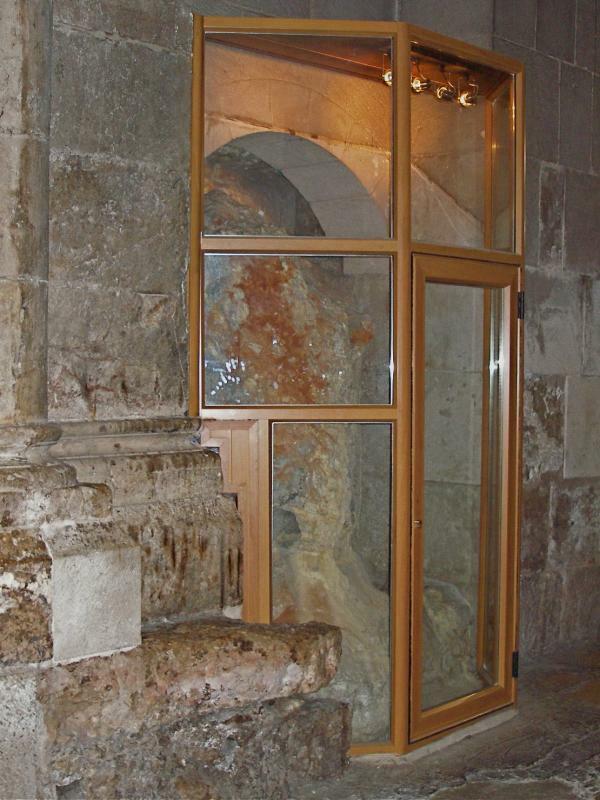 This stone monument encloses the tomb (sepulchre) where it is believed Jesus Christ lay buried for three days — and where he rose from the dead. A high-tech photogrammetric survey late in the 20th century showed that the present edicule contains the remains of three previous structures, each encasing the previous one, like a set of Russian dolls. 13. At busy times, Greek Orthodox priests control admission to the edicule. Inside there are two chambers. In the outer one, known as the Chapel of the Angel, stands a pedestal containing what is believed to be a piece of the rolling stone used to close the tomb. 14. A very low doorway leads to the tomb chamber, lined with marble and hung with holy pictures. On the right, a marble slab covers the rock bench on which the body of Jesus lay. It is this slab which is venerated by pilgrims, who customarily place religious objects and souvenirs on it. The slab was deliberately split by order of the Franciscan custos (guardian) of the Holy Land in 1555, lest Ottoman Turks should steal such a fine piece of marble. An agreement between the major Christian communities at the church enabled work to begin in May 2016 to reinforce and restore the edicule. The work was undertaken by a team of scientists from the National Technical University of Athens. In October 2016 the team removed the marble slab, exposing a layer of fill material covering another slab of marble with a small Crusader cross etched on it. Beneath it was the bench on which the body of Jesus lay. When the team restored the marble cladding and resealed the burial bed, they also cut a small window into the southern interior wall of the shrine to expose one of the limestone walls of the burial cave. The multi-million-dollar restoration was completed in March 2017. The reddish-cream marble of the edicule emerged cleaned of centuries of grime, dust and soot from candle smoke, and freed from a grid of iron girders that had held it together since 1947. But scientists warned that even more work would be necessary to shore up the unstable foundations of the shrine and the surrounding rotunda to avoid the risk of collapse. 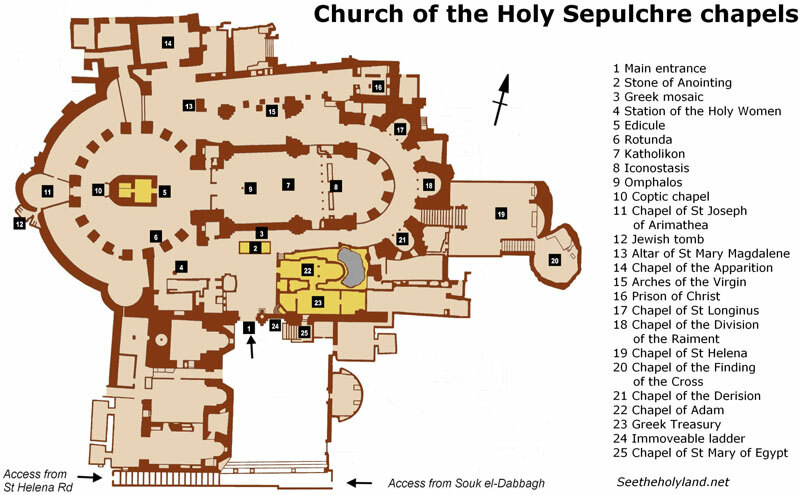 Ownership of the Church of the Holy Sepulchre is shared between the Greek Orthodox, Catholics (known in the Holy Land as Latins) and Armenian Orthodox. The Greeks (who call the basilica the Anastasis, or Church of the Resurrection) own its central worship space, known as the Katholikon or Greek choir. 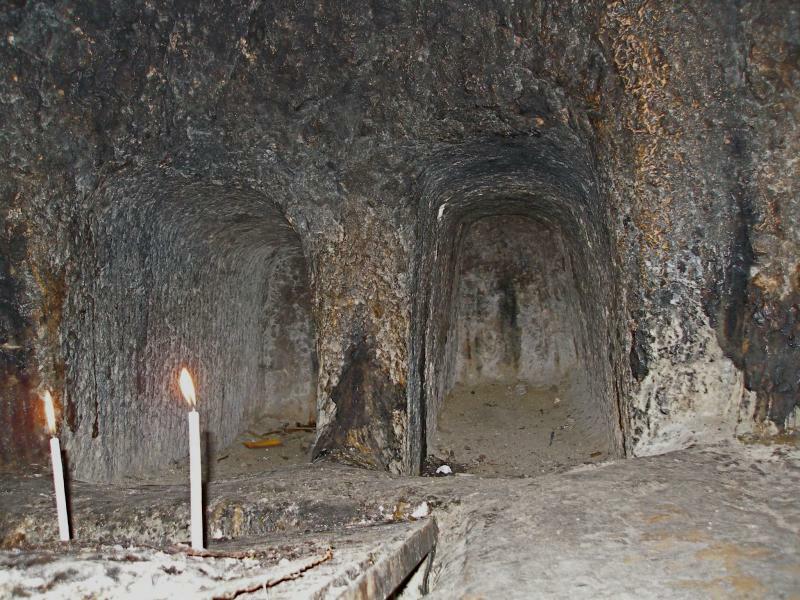 The Armenians own the underground Chapel of St Helena which they have renamed in honour of St Gregory the Illuminator. The Catholics own the Franciscan Chapel of the Apparition (which commemorates the tradition that the risen Christ first appeared to his Mother) and the deep underground Chapel of the Finding of the Cross. Three minor Orthodox communities, Coptic, Syriac and Ethiopian, have rights to use certain areas. The Ethiopian monks live in a kind of African village on the roof, called Deir es-Sultan. The rights of possession and use are spelt out by a decree, called the Status Quo, originally imposed by the Ottoman Turks in 1757. It even gives two Muslim families the sole right to hold the key and open and close the church — a tradition that dates back much further, to 1246. Each religious community guards its rights jealously. The often-uneasy relationship laid down by the Status Quo is typified by a wooden ladder resting on a cornice above the main entrance and leaning against a window ledge. The ladder has been there so long that nobody knows how it got there. Various suggestions have been offered: It was left behind by a careless mason or window-cleaner; it had been used to supply food to Armenian monks locked in the church by the Turks; it had served to let the Armenians use the cornice as a balcony to get fresh air and sunshine rather than leave the church and pay an Ottoman tax to re-enter it. The ladder appears in an engraving of the church dated 1728, and it was mentioned in the 1757 edict by Sultan Abdul Hamid I that became the basis for the Status Quo. It would be too much to expect that the ladder seen today has resisted the elements since early in the 18th century. In fact the original has been replaced at least once. In 1997 the ladder suddenly disappeared for some weeks, after a Protestant prankster hid it behind an altar. When it was discovered and returned, a steel grate was installed over the lower parts of both windows above the entrance. And in 2009 the ladder mysteriously appeared against the left window for a day. The ladder, window and cornice are all in the possession of the Armenian Orthodox. And because the ladder was on the cornice when the Status Quo began in 1757, it must remain there. Visitors may easily be disillusioned by the church’s contrasting architectural styles, its pious ornamentation and its competing liturgies. But is this the place where Christ died and was buried? “Very probably, Yes,” declares biblical scholar Jerome Murphy-O’Connor in his Oxford Archaeological Guide The Holy Land. Eusebius, the first Church historian (in the 4th century), says the site was venerated by the early Christian community. 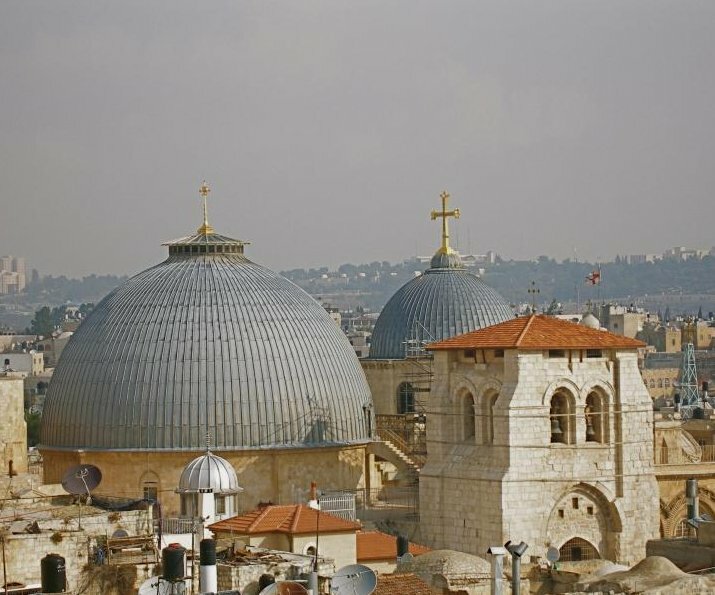 One major objection raised is that the Church of the Holy Sepulchre is inside the city walls, while the Gospels say the crucifixion took place outside. Archaeologists have confirmed that the site of the church was outside the city until about 10 years after Christ’s death, when a new wall was built. Some favour a competing site, the Garden Tomb. Though it offers a more serene environment, the tombs in its area predate the time of Christ by several centuries. Church of the Holy Sepulchre chapels, dealing with the other devotional areas. Benelli, Carla, and Saltini, Tommaso (eds): The Holy Sepulchre: The Pilgrim’s New Guide (Franciscan Printing Press, 2011). 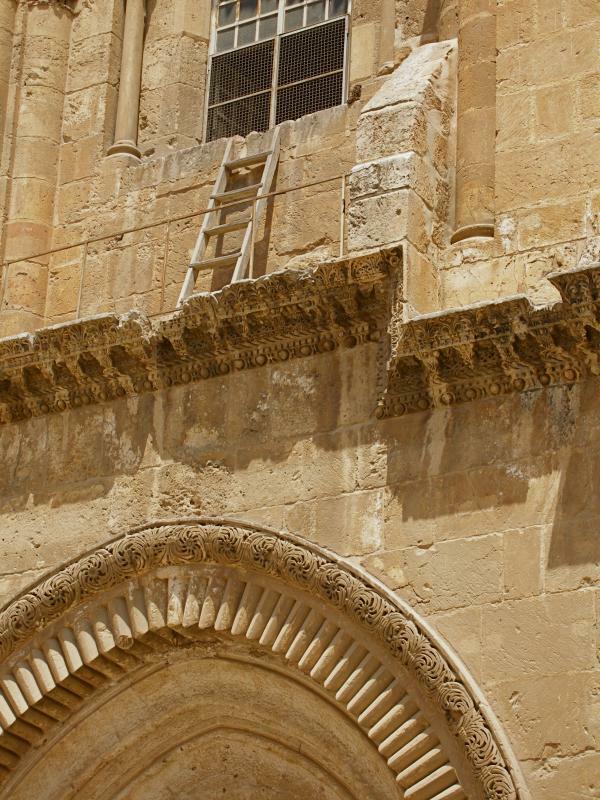 Herman, Danny: “Who Moved the Ladder?” (Biblical Archaeology Review, January/February 2010). Simmermacher, Günther: The Holy Land Trek: A Pilgrim’s Guide (Southern Cross Books, 2012). Waugh, Evelyn: “The Plight of the Holy Places” (Life, December 24, 1951.